Emily Saso’s query almost literally jumped out of my slush pile. She had me hooked within the first sentence. I adore her writing and the way that she thinks. 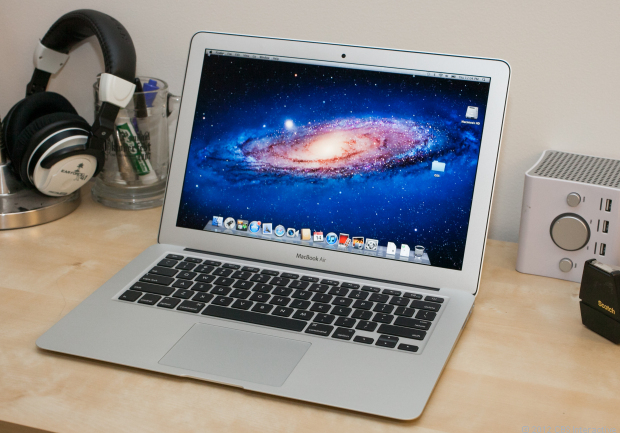 Emily is not only a fiction writer, but she also freelances for trade publications, newspapers and magazines including the Toronto Star and Wired. Her first manuscript, which is adult literary fiction with a dusting of magical realism, was awarded an Ontario Arts Council Writer’s Reserve Grant. 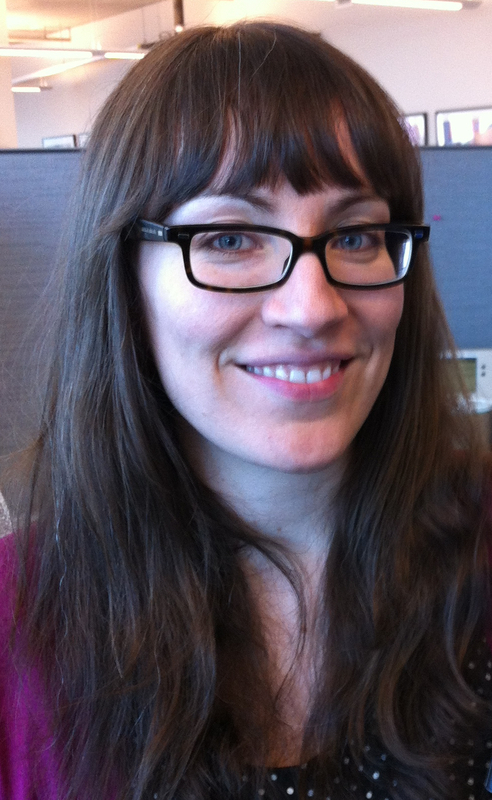 Her short story, The Swimmer, was long listed in the Canadian CBC Writes Short Story contest. Emily blogs at Ego Burn. I’m delighted to have her guest post and contribute to my continued blogging laziness (blaziness?). 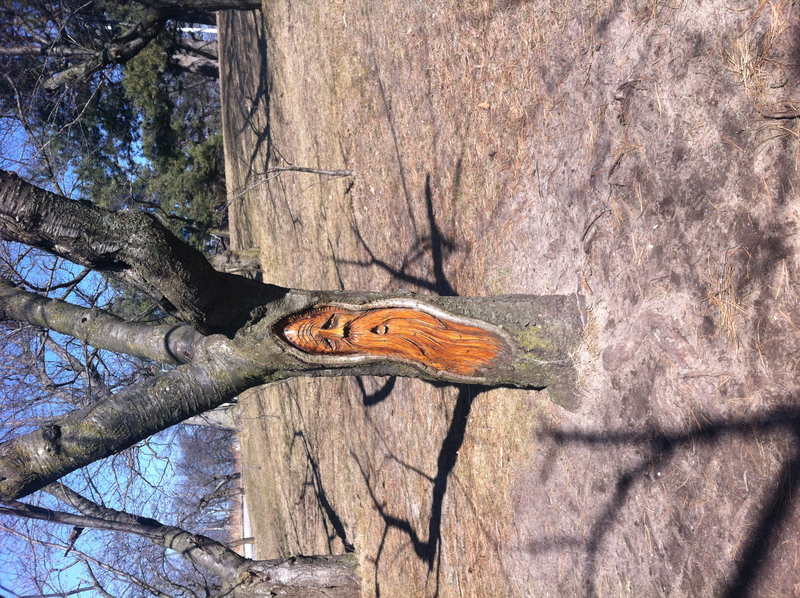 Emily took her imagination outside for a stretch and found this tree carving in a Toronto park. It spawned her latest idea, a short story about a man trapped in a tree. If you’re a writer, then you know how important stretching can be. All those hours spent in front of a computer, shoulders hunched, neck strained. Arranged marriages between writers and massage therapists should really be the law. Some days, I find myself so focused on physically stretching (my upper back is usually tight as a fist) that I neglect to attend to the most important muscle in every writer’s body: the imagination. I can’t believe I’m about to admit this, but when I first started writing fiction, for some ridiculous reason, I would regularly forget that anything, literally ANYTHING was possible. I mean, it’s my story, they’re my characters—how could I have lost sight of the fact that the possibilities were endless? It was as though I hadn’t quite made the transition from reader to writer, and that my most important muscle was still idling on the couch expecting someone else to stimulate it. To make sure that this part of my anatomy never atrophies again, I’ve spent the last couple years consciously learning how best to stretch out my imagination by paying attention to what pushes it and what fuels it. Other than reading incredible books (like, duh) here’s what helps me ashtanga the heck out of my imaginus maximus. I feed off the energy of other creative people, sure, but I also like a bit of friendly competition. For example, I recently attended a writing workshop where we were expected to read our work – *gulp* –out loud. Because of my competitive nature, I pushed my creativity to the limit. The result? New ideas for my second novel. Whenever I need to stretch my emotional imagination, I dive into my (nerd alert!) “memory box” from high school. That thing is stuffed so full of angst-ridden poetry and bleeding-heart love letters I never mailed that its hinges popped off long ago. Writing fiction often keeps me cooped up alone, sometimes for days on end. Spending so much time inside my own head instead of socializing means that I miss out on the wacky eccentrics out in the real world. Almost all of my fictional characters have been inspired by strangers I’ve come across at bars, in parks, on public transportation, in cafeterias and, my favorite, the lineup at Starbucks. Ah. I can feel the stretch just thinking about it. How do you stretch your imagination?